Last year I said “The Killing of a Sacred Deer” was the first film to really take the techniques of “The Shining,” a classic that’s getting close to forty years old, and really use them effectively to inject shivers and creeps into the story. Amazingly, “Hereditary” is finally the second. There are close-up shots, editing and sound techniques that are bona fide Kubrickian. Aster also stealthily employs a nominal buzzing sound that begins in low frequency beneath the soundtrack (at first I thought there was some audio bleed from the theater next door), which in this case is the same technique Lynch has used in his films to elicit a subconscious vertigo effect from his audience. For “Hereditary,” it adds to the goosebumps going off in you before the first reel is even over. 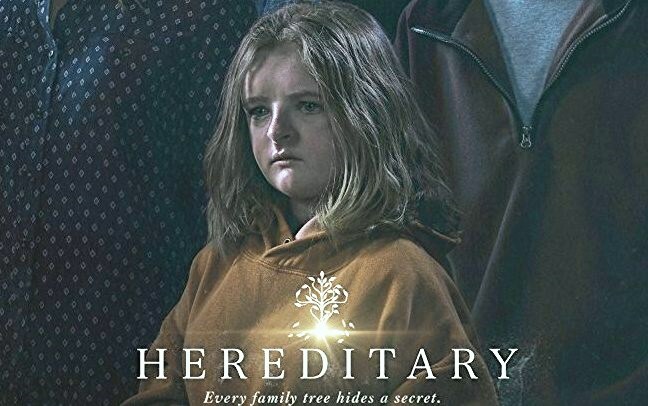 “Hereditary” is a ghost story of the after life penetrating the presence of a Utah family, one that is marked by dysfunction. Toni Collette stars in her first ghost story since “The Sixth Sense” (remember how that was the box office phenomenon of 1999?) and while she has made a successful living as a tiny furniture artist and has a husband (Gabriel Byrne) who she shares two children (Alex Wolff and Milly Shapiro), she falls too easily into the throes of depression. She had sleepwalking issues that were long dormant until her mother just died, and while she died at the house, there felt a life-lasting estrangement between the two. Grandma didn’t always seem to want the best for the children, either, to add to the domestic turmoil – but this is just suggested. The husband here, never is as helpful as he thinks, failing to interject when there are ugly fights between family members. This is a family that is perpetually cursed. Collette searches for relief at group grief counseling once, but seems fraught that she comes off as a whack job when divulging all of her family problems. The older child is always stoned and avoiding real life, the younger child is a loner who sees ghosts. This is a family damned by undefined trauma, it doesn’t help that grandma has died and transferred the ugly inner demons unto her daughter, and yet there is a new accident that kicks everything up a notch. Honestly, it bothered me that there doesn’t seem to be a police inquiry. The film suggests, yes it was an accident, and that’s all it was. It’s something of a nagging flaw, but it’s like Aster doesn’t want to slow down the film by bringing police logic to anything that’s happening. Aster is interested in other kinds of logic, other kinds of emotional truth. This is a horror film that contains séances, happy and angry spirits, hallucinations and pyromania, yet Aster is bringing the best character reaction to the table, making it as honestly heard and in sync to the rhythms of real life, that when we sense a spirit, it gives us the quivers that we’re experiencing déjà vu, or something as close to real life as it is. “Hereditary” is powerful filmmaking in the same way “The Exorcist” or “The Shining” were, as they all were emotional rollercoasters. They all get under your skin. It makes “The Conjuring” from a few years ago feel boring by comparison. “Hereditary” should be a sizable hit, but I don’t know if it becomes the smash hit in the same way as “The Sixth Sense” or “The Conjuring” were. People like to get scared. But they don’t like getting that scared. Film Cousins: “Race with the Devil” (1975); “The Shining” (1980); “The Sixth Sense” (1999); “The Skeleton Key” (2005).